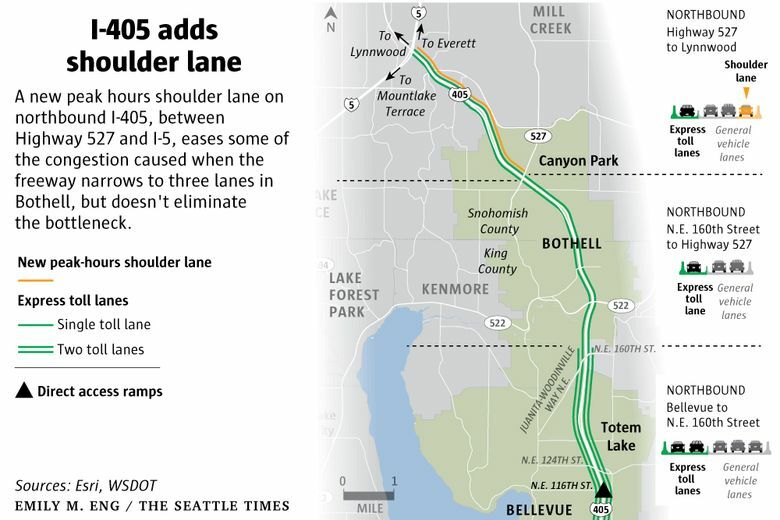 A new shoulder lane open for evening commutes on northbound I-405 between Bothell and Lynnwood is the first of several planned shoulder expansions on state highways in the coming years. One week in, the new shoulder lane on Interstate 405 — the first of several planned shoulder expansions on state highways in the coming years — has reduced travel times, although officials stress that it is too early to make any official conclusions. On April 24, the Washington State Department of Transportation (WSDOT) opened a 1.8-mile section of the shoulder of northbound I-405, between Highway 527 in Bothell and Interstate 5 in Lynnwood. The shoulder, which will generally be open only during the evening commute, adds a fourth lane of traffic to I-405, to go with the two existing regular traffic lanes and one express toll lane. About 1,000 cars per hour get on I-405 at the 527 onramp, which previously created a forced merge into traffic and slowed down the roadway. With the shoulder lane open, cars are able to drive from the ramp straight onto the shoulder, and continue as if it’s a regular lane. Open to buses, but not heavy trucks, the shoulder lane is the first project to be funded with revenue from I-405’s express toll lanes, which brought in $15.6 million in their first year of operation, triple the expected amount. 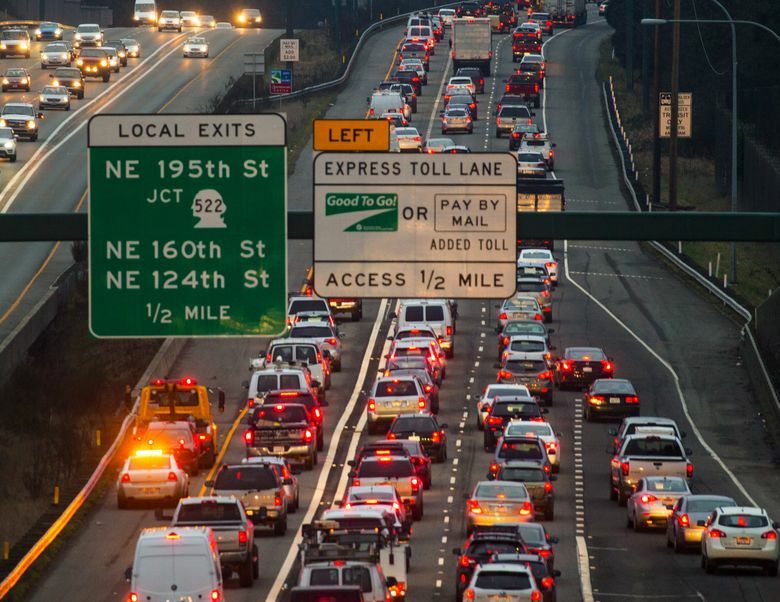 Those toll lanes — where drivers can choose to pay a toll that averages $3 but can be as much as $10 during peak hours — have improved travel times from Bellevue to Lynnwood, but choke points remain, as I-405 narrows from five lanes to three in Bothell. WSDOT has plans to add additional lanes to I-405 in that stretch, but those are far in the future and, as yet, unfunded by the Legislature. While the freeway remains only three lanes from Bothell north to Highway 527, adding a fourth lane north of there seems to have — at least so far — shortened travel times for the whole northern stretch of I-405. For the first three months of this year, the average travel time in the general lanes, for the seven miles from 522 to I-5, peaked at about 20 minutes during the evening commute. On a typical day last week, after the opening of the shoulder lane, commute times peaked at about 12 minutes. And in the express toll lane — used by a half dozen bus routes — average peak travel times went from about 10 minutes to about 8 minutes. Kim Henry, the project director for I-405, said that traffic around the region was light last week, and that WSDOT will continue to track the data to see how it plays out. The shoulder lane will typically be open about five hours per day during the evening commute, but it will vary depending on traffic conditions. And while it will eventually open automatically, for now WSDOT is driving the full length of the shoulder to make sure there are no crashes or blockages in the way before opening it to traffic. When not open, it will remain a shoulder, usable for breakdowns, maintenance and emergencies. If there’s a collision while the shoulder lane is open, it will be closed, via electronic signage. Opening the shoulder to traffic cost about $11.5 million, mostly for a wall to reduce noise and new electronic signs to let drivers know when the lane is open, money that largely came from I-405 tolls. WSDOT has two other upcoming projects to open shoulder lanes at peak hours, in hopes of reducing congestion. A bigger project, to reconstruct and open shoulder lanes in both directions of I-90 for stretches between Eastgate and Issaquah, is scheduled to begin construction next year, with a planned opening in 2020. It would cost about $73 million. A project to open the shoulder of northbound I-5, between Everett and Marysville, is tentatively scheduled to begin construction in 2019. And, as part of Sound Transit 3, long stretches of the shoulders of I-5 and I-405 and state routes 518 and 167, will be modified to allow bus travel, with openings expected between 2019 and 2025.